Gout is a type of inflammation of the joints and swellings of a recurrent type. Gout is chronic in character and occurs in acute attacks. It is a disease that generally affects men; however, it also seen in post menopausal women and those who over-indulge in alcohol consumption. Gouty arthritis is another very painful condition that would require immediate treatment. Gout is essentially a form of arthritis that is characterized with sudden bouts of severe pain, inflammation and tenderness in the joints, known as gout attacks. Because of the strong connection between diets and gout, the condition was regarded as an affliction of the wealthy in the past. With modernization and social reforms in the past century our economic condition has greatly improved and there is less disparity, particularly with regard to the foods we consume. This condition has therefore become a lot more common and can afflict absolutely anyone, although men are more susceptible, as are post-menopausal women. Gout is known to be quite debilitating at times because of the severity of gout attacks. The excruciating pain can cause you to wake up in a sweat, causing what is often described as a feeling of fire or burning sensation in the afflicted joint. The plus point is that gout treatment is extremely effective and the best form of treatment would be through a gout diet. Sufferers of gout need to be careful about their diet as there are certain foods to avoid with gout, as they could trigger a higher frequency and increased severity of gout attacks. 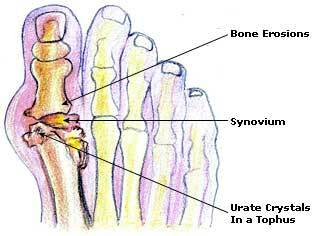 The most common Gout symptom is acute pain in the big toe, which becomes tender, hot, and swollen in a few hours. It is therefore also known as the toe/feet disease. Likewise, it is known to affect other joints such as the knees and the wrists. It is possible for more than one joint to be affected simultaneously. The patient may experience gout attacks close to midnight or in the early hours of the morning. The intense pain can even cause the patient to wake up. The symptoms of an acute attack would generally subside within a week. During this span of time, the patient is liable to run a mild fever and experience a loss of appetite. A serious complication of gout is the presence of kidney stones containing uric acid. In some cases the kidneys get damaged and do not function properly.Gout attacks are most severe within the first 12 to 24 hours of their onset, but the joint discomfort and pain although lessened, do not subside for a few more days or even for a week. It is important that these symptoms are not neglected as in the absence of appropriate gout treatment there could be other complications and also permanent damage to the affected joints. A gout diet suffices to control and reign in the condition at most times, but it would still be important to consult with your doctor and keep him informed. It is not easy to pinpoint the exact gout causes. However, having higher than normal amounts of uric acid in the body increases your risk of gout. This excess uric acid tends to crystallize and accumulate in the joints, thus causing the swelling of the joints. This triggers the painful symptoms associated with gout. The only way to experience gout relief is by following a disciplined diet for gout. Natural remedies for gout include a variety of fruits and vegetables that help to regulate the levels of uric acid in the body. Some of the gout home remedies are as follows. Other causes of gout are heredity, alcoholic drinks, regular eating of foods rich in protein and carbohydrate, lack of proper exercise, and stress. A clear understanding of the risk factors is always useful as it can help to prevent the onset of the condition or at least delay it. If you can identify with any of the risk factors it may also give you some insight into possible causes and triggers of gout attacks. Dietary Habits: People who follow a diet that comprises of a high amount of red meats, oily fish, yeast and internal organs are very susceptible to gout. A regular or high intake of alcohol, particularly beer, is also known to increase the risk of developing gout. In the past it the consumption of red meat among the population was a rarity as it was more of a privilege for the wealthy and ruling classes, which is why it was often referred to as a disease of the rich. Medical Conditions and Drugs: The presence of certain conditions could put you at a higher risk of developing gout. Conditions like diabetes and high blood pressure are known to cause such complications at times, particularly if not treated appropriately. High cholesterol levels and a narrowing of the arteries also contribute to the development of gout. Certain drugs could also cause a rise in uric acid levels, thereby contributing to the occurrence of gout. These include drugs like certain diuretics used in the treatment of high blood pressure, as well as low dose aspirin drugs and also many anti-rejection drugs prescribed for patients who have undergone transplant surgery. Self care is an important aspect of gout treatment, whether or not you are on medications for the condition. Home remedies for gout pain, whether in the knee, big toe, ankle or foot are meant to facilitate healing and provide relief from the painful symptoms of gout attacks, they are not meant to treat the condition itself. The most important consideration should be the recommendations of your doctor and it is imperative that you follow his gout treatment recommendations meticulously, taking medications as advised. If you suffer a gout attack, make it appoint to rest and do not try to use the affected joint. Instead rest with the affected joint elevated if possible. If the affected joint restricts your ability to move around comfortably, then make it a point to use a cane or walking stick for support, no matter how unnecessary you may think this to be. Ice packs or cold compresses are useful in gout treatment for some relief from the pain and also to reduce the inflammation. You could also try applying hemorrhoid creams to the affected area to reduce inflammation. Make sure that you keep yourself well hydrated to minimize the risk of further gout attacks. The cherry, sweet or sour, is considered in effective treating gout. Consume about fifteen to twenty cherries a day, preferably as soon as you wake up. Subsequently, you can begin to reduce the amount of cherries you consume. Research into the effectiveness of cherries for treating gout showed that an antioxidant in cherries called anthocyanins helps to relieve inflammation as well as reduce the frequency of gout flare-ups. It is best to consume fresh cherries and avoid the canned variety. Raw vegetable juices are used for gout treatment. A mocktail of carrot, beetroot and cucumber juice seems to be effective in treating gout. Add 100 ml of beetroot and 100 ml of cucumber juice to 300 ml of carrot juice and this must be consumed on a daily basis. The juice of French or string beans has also proved effective in treating gout. About 150 ml of this juice should be taken daily by the patient suffering from this disease. Apples are regarded as an excellent source for curing gout. The malic acid contained in them is believed to neutralise the uric acid and afford relief to gout sufferers. The patient is advised to take one apple after each meal. Lime is also used as a source in treating gout. Vitamin C is known to prevent and cure sore joints by strengthening the connective tissues of the body. The citric acid found in lime is a solvent of the uric acid which is the primary cause of this disease. The juice of half a lime, squeezed into a glass of water, should be taken twice daily. One of the natural gout remedies is a paste of water and half a cup of charcoal powder. This remedy is perfect for gout of the foot. The infected foot can be soaked in this mixture completely for at least 30 minutes to an hour for effective pain relief. Some of the herbs that can be used for effective gout pain relief include devil’s claw root, white willow bark, ginger root and meadowsweet flower tops and leaves. All these herbs contain powerful anti-inflammatory properties which can relieve pain caused in gout. Other herbs like cayenne, licorice, boswellia and feverfew are also considered to be natural gout remedies. Safflower can be taken in capsule form for speeding up the healing process in the case of gout. Safflower has properties which help in improving circulation, cleansing the blood and also alleviating the pain caused in gout. If you suffer from gout in the toes, one of the natural gout remedies would be a mixture of water and 1/3 cup of ground ginger. The feet can be soaked in this mixture for 30 minutes which will cause sweating and therefore elimination of uric acid. It is important to bathe thoroughly after following this remedy as ginger could cause skin irritation once the skin dries. Prepare a paste by mixing one part whole wheat powder and one part mustard powder with water. This paste can be applied on the aching body parts and left overnight for effective gout pain relief. For an acute attack, there is no better remedy than a fast of orange juice and water. In severe cases, it is advisable to undertake a series of short fasts for three days or so rather than one long fast. After the acute symptoms subside, the patient may adopt an all fruit diet for another three or four days. Thereafter, he may gradually embark upon a well-balanced diet of natural foods, with emphasis on fresh fruits, raw vegetables, and sprouts. The patient should avoid all purine and uric acid-producing foods such as all meats, eggs, and fish; tea, coffee, sugar, white flour and its products; and all canned, processed, and fried foods. The patient needs to be careful of the kind of food he/she consumes. Foods to avoid include purine rich foods as well as those foods which produce uric acid. Therefore foods such as meat, eggs, fish, sugar, coffee and tea, products prepared from white flour, fried foodstuffs and all sorts of processed and/or canned food must be avoided. The gout remedies mentioned above will help to reduce the severity and frequency of the painful symptoms of gout. Along with these gout natural remedies, however, it is important to seek professional medical help and follow the suggested medications. When seeking treatment and prevention measures for arthritis one could also make a list of foods that would provide the body with some best natural vitamins that are essential for the body. Following an appropriate gout diet should be central to any gout treatment plan as this is the single greatest influence on the condition. It is essential that you severely restrict the levels of animal protein in your diet. Red meats are known to be the worst possible food for gout patients. High protein levels cause a spike in blood uric acid levels, triggering severe gout attacks. Limit your intake to very small portions of lean meats, such as poultry or certain fish like salmon. Keep in mind that not all fish are healthy for you as many are extremely high in purines. Mackerel, herring, and anchovies are just a few of the fish foods to avoid with gout. It’s important that you keep yourself well hydrated by drinking plenty of water. Avoid caffeinated and carbonated drinks as these will simply aggravate the problem. If you are experiencing a gout attack it may help to consume some oral rehydration solutions. Avoid consuming any alcohol as it severely impairs your body’s ability to eliminate excess uric acid. While suffering from gout, foods to avoid also include vegetables like spinach, asparagus and cauliflower and legumes like beans, lentils and peas. Foods like mushrooms, oatmeal, yeast products and white flour bakery products should also be completely avoided. Your doctor or nutritionist would however be the best source of information on a gout diet or any specific supplements and nutrients or vitamins for gout. One of the best tips when considering gout diet is to check out some gout recipes and prepare a gout diet chart or have a gout diet menu that will help you know and prepare some new food every day. A typical gout diet invariably excludes all forms of alcohol and alcoholic beverages.